I found the cutest Etsy shop!! It is called Sweetness and Smyrna and features super cute crocheted items for baby. I chose a few items for our baby girl to wear and am very happy with them. The first thing that I was sent is a a pink and a blue crocheted hat. That hat has a super cute big button on it. I have the pink hat packed for the hospital for baby girl! This set actually can be purchased with matching crochet pants as well which are adorable. How I found the Sweetness in Smyrna Etsy shop is by searching John Deere baby items and finding this super cute crocheted hat and pants. As most of my readers know, my parents have a farm that we go to often. My dad has a John Deere tractor and we love the brand. I am going to get some pictures of our baby in this outfit at the farm for sure this fall! 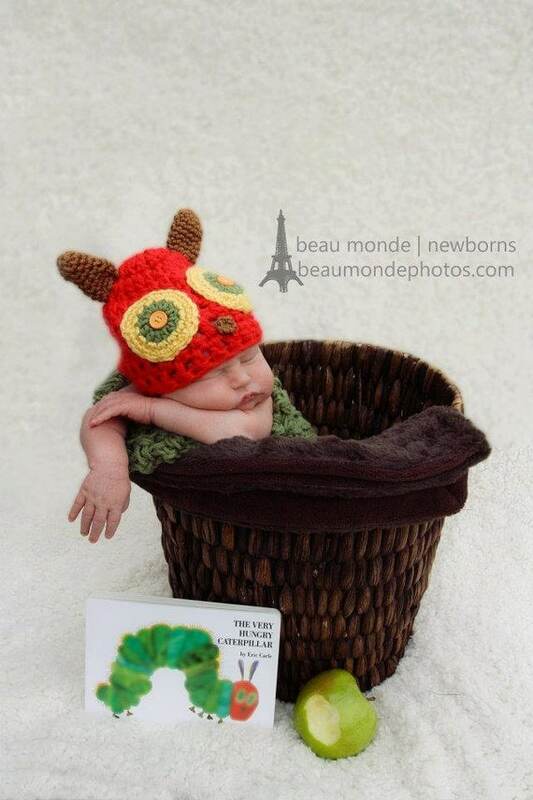 These would be perfect for a newborn shoot as well. Also, just look at this Very Hungry Caterpillar outfit!! The items from Sweetness in Smyrna are so adorable for baby and would make a great shower gift for the loved ones in your life. The giveaway will be for any baby hat or bonnet from Sweetness in Smyrna. I love her items they are all so beautiful and original ..LOVE LOVE LOVE !! !